A legacy is something that is passed on to the next generation and is a fitting name for the best long-lasting, freeze-dried meals available. Legacy Premium’s long shelf life foods make up the best food storage meals and products in the business. They are convenient to prepare and store and Legacy Premium freeze-dried meals will last on your shelf for up to a LONG twenty-five years if stored properly. This is the best shelf life you could hope for in a freeze-dried, emergency food supply. Many people worry about the best way to properly rotate their storage foods/meals before they spoil. The best news is that Legacy Premium freeze-dried foods have up a twenty-five year- long shelf life, no rotation required. Legacy takes away that stress with a unique packaging system that ensures low residual oxygen levels, thus leading to a long shelf life. The best other companies can do is aim for the industry standard of 2%, but Legacy’s freeze-dried meals remain well below 1%. Each freeze-dried meal and storage food is sealed in a Mylar pouch with an Oxygen Absorber and a Nitrogen Flush, thus double securing a long shelf life. The best part is that freeze-dried foods and meals are stored in stackable buckets that can be opened and resealed without affecting the foods’ long shelf life. Interested in our Quality Control Process? Click Here. For years to come Legacy’s long shelf life foods and freeze dried meals will continue to be safe, great-tasting, and full of the best nutrients that you and your family will need. The food storage developers at Legacy Premium have carefully examined other companies’ storage products. These companies may claim to have meals with a long shelf life, but the ingredients they use, especially canola oil, will become rancid after a year at best and spoil the food. Legacy avoids this problem by using the best ingredients possible then freeze-drying and sealing the foods/meals in pouches for a long shelf life. 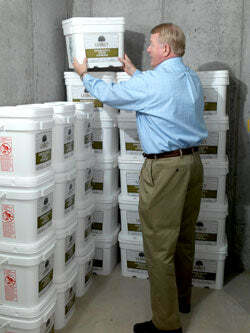 Legacy storage foods and freeze-dried meals are convenient, affordable and have up to 25-year-long shelf lives.